Children love the countryside and the freedom of being able to run down dirt roads and across fields. For the more intrepid, the woods offer deer tracks and (if you are very lucky) black and white porcupine quills. Highlights at different ages will include communicating with gestures in the playgrounds of Montevarchi, climbing up the medieval tower of Galatrona, or trekking into Mercatale Valdarno for an ice cream (3 km). Some children discover the joys of picking tomatoes with Allen in the vegetable garden, while others become amateur entomologists and collect every insect they can find. All such activities can make Il Poggiolo an exciting place for youngsters. 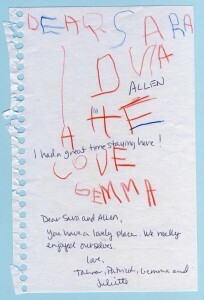 At times children make a special connection with the place and leave a sweet note, such as the one from Gemma (age 5) – here on the left. I am very sorry not to still have the red crayon drawing of a spider which was given to me by another 5 year-old, which graced the refrigerator in the kitchen for a couple of months this summer. I think this young man will be the next Gerald Durrell. 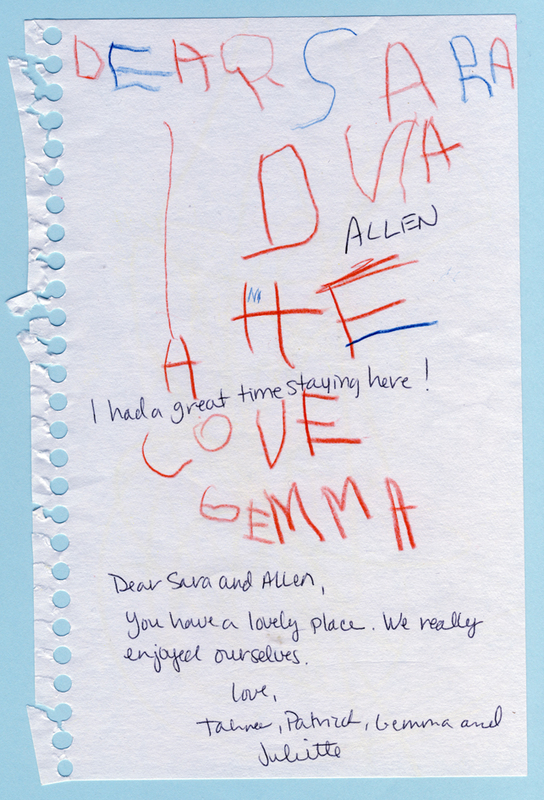 One of my favourite notes was from an somewhat older child who wanted to commemorate his stay at Il Poggiolo the first year we began receiving guests. We had all watched the World Cup soccer finals together, and when Italy won against France (of course we were all rooting for Italy), he ran outside in amazement to listen to the cars blaring their horns with joy all across the valley. I do not think he will ever forget that collective, public cacophony of celebration.